Made for most Ford, Mopar & GM applications, adjustable dowel pins correct improper register bore alignment of bellhousing to engine crankshaft center line (a must when dialing-in bellhousings). Available offsets: .000", .007", .014", and .021". Sold in pairs. 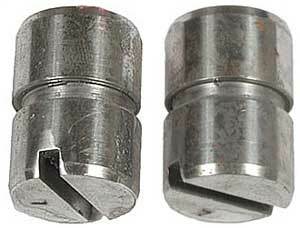 15930 - Lakewood Bellhousing Dowel Pins is rated 5.0 out of 5 by 1.